In recent years both government and private entities have dedicated a significant amount effort to the management of Australia’s natural water resources, and now Campbell Scientific have a rugged data logger which can assist with monitoring schemes. Discussions of desalination plants and buy-back of irrigation licenses have been discussed and the respective federal governments have committed large sums of money to better understand the national water budget and manage its use. Monitoring the natural resources of the country has many hurdles to overcome, one of which is monitoring sites in remote and challenging locations, as well as ensuring the accuracy of the data recorded at these sites. Site conditions such as temperature extremes, power limitations and telemetry availability all contribute to making the delivery of quality data difficult. For example, a site in a deep valley often will not receive many hours of effective solar panel charging weather in a day. Similarly, these sites are difficult to get telemetry coverage from, due to physical obstructions and the angles at which some antennas must be mounted. Campbell Scientific manufacture a range of rugged data loggers that are designed with these conditions in mind. Their low power design and wide operating temperature range ensures that a site with limited or no access to power and demanding environmental surroundings is not a reason to exclude the site from the monitoring scheme. The CR800, CR850 and CR1000 data loggers have already been widely used in hydrological and hydrographic applications throughout Australia and many other countries throughout the world. Their flexibility and their ability to perform complex tasks with ease provide peace of mind for both system designers and field operators. These data loggers can be customised and reconfigured to allow the same hardware to be used at all sites in a network with a minimal amount of fuss. The same logger can be configured with a radio, a cell phone, a satellite phone, cable connections or combinations of these to suit the application. 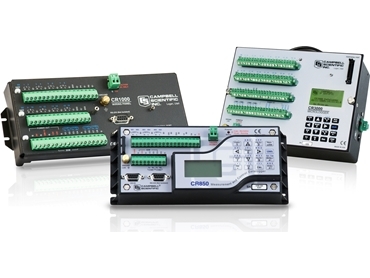 Campbell Scientific data loggers also support a number of open protocols to provide easy interfacing to PLC’s or SCADA monitoring systems. The CRBasic programming language provides the tools required to build custom applications or to support special protocols. Campbell Scientific data loggers support all commonly used sensor types and telemetry options, which often proves to be a highly cost-effective solution when compared to another device, such as a PLC with all the various analog measurement cards. Campbell Scientific Australia's sales and support team can assist in selecting the logger that best suits the needs of the application and can offer suggestions and support in designing all aspects of a monitoring scheme.